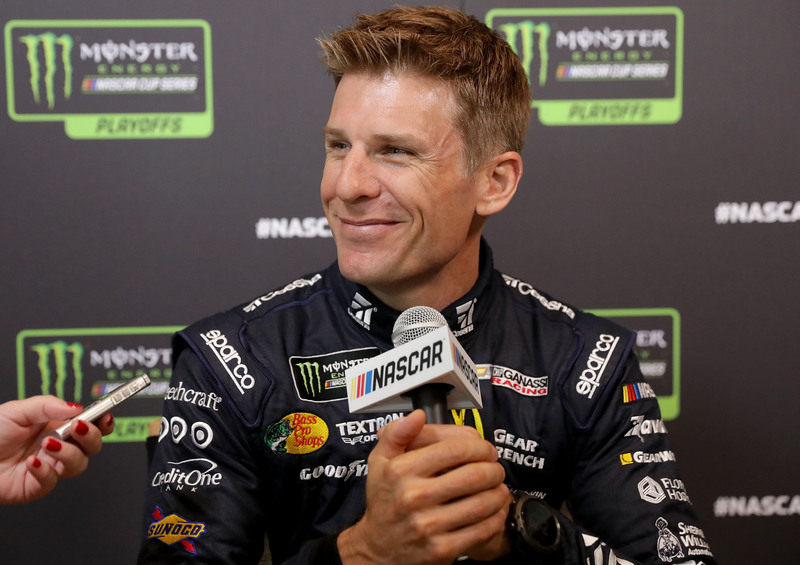 The series of 12 Questions driver interviews continues this week with Jamie McMurray of Chip Ganassi Racing. These interviews are recorded as podcasts but also transcribed for those who prefer to read. Just every once in a while. Not that often. I did have one just recently, but I don’t remember the last time I had a dream about racing. Does it matter…to me? Is it better asked if someone gets into you intentionally? I’d say if it matters to them. Like is it going to make a difference if you apologize, essentially? I think it does make a difference. If you’ve been racing awhile, you know how everyone races you. If it’s intentional, I probably wouldn’t send a text because I feel like that person would know why. But most of the time it’s not intentional, and I always send a text or call. Like I got into Daniel Suarez at Pocono on a restart. It was actually like a chain reaction — he hit the car in front of him and I hit Daniel. I knew he was going to be at the (tire) test at Darlington, so I just waited until I got to Darlington and went over and talked to him. I kind of knew he wasn’t going to be mad, but you also never know. So yeah, I always reach out to somebody if I get into them. 4. NASCAR comes to you and says they’re bringing a celebrity to the track and they want you to host them. That’s who you’d want to host? That’s who I’d like to host, yes. And my wife says she’s OK with that. Well, not really. I said that jokingly, but I would be OK with that. I think that she’s down the road here in Detroit. Oh wait, (Justin Verlander) got traded to the Astros. Yeah, and then they won the World Series. 5. In an effort to show this is a health conscious sport, NASCAR decides to offer the No. 1 pit stall for an upcoming race to the first driver willing to go vegan for one month. Would you do it? Have you gone vegan before? I know you’re healthy. I’ve eaten a lot of plants. I would assume once you do something like that, it wouldn’t take a long time to kind of get acclimated to it. Like anytime someone changes their diet, it takes a little time to adapt to it. But what am I getting? Oh. I don’t know if that’s really going far enough. You want more of a reward? I do. I think I want more of a reward for that, yes. 6. It’s time for the Random Race Challenge. I’ve picked a random race from your career and you have to tell me where you finished. I’m never going to guess this. You’re not good at remembering races? I don’t know. I guess if you picked the race I won. No, I have to make it somewhat harder. OK, this is the 2015 Sonoma race. I greatly appreciate you making it somewhat recent. 2015 Sonoma, let’s see…I have to say where I finished? Ninth. Ugh, I was close. I was gonna say 11th. You started 18th. Kyle Busch won. This was after you’d gotten back to back poles the previous two years. You finished behind Sam Hornish and ahead of Tony Stewart. Does this ring a bell at all? (Cringes, rubs his face.) I don’t know. I don’t know who the best rapper alive is. I wish that the face rub translated to the interview. I was trying to just rattle a random name off, but I felt like I would seem less cool if I said a name than it would if I just said I don’t know. Punchable? (Gives a blank stare) What are the criteria for a punchable face? It could be somebody who you want to punch, but it could also be someone who has that face where you’re not mad at them, but their face looks punchable. I feel like we live at a time where we’re supposed to be nice, and be kind to each other, so I’m going to say no one. (Stares) Was it late when you (wrote these)? What’s the…? Look, here’s the thing, Jamie. This is the eighth year doing the 12 Questions (actually the ninth year), and I’m running out of questions. I have to make some really weird questions. So I have Taylor Swift, LeBron James, and Tom Hanks. What are the positions I have to fill? Crew chief, spotter and motorhome driver. OK, I’m going to put LeBron as my spotter because he’s big and he can be intimidating to the other spotters, and I think that’s important. (Josh Wise, sitting nearby, tells McMurray he should have made Taylor Swift the spotter). I was going to let her drive the bus so I can spend more quality time. My little girl loves Taylor Swift, so I feel like if she drove our bus, that would be pretty big. It wouldn’t really matter how the race went, as long as Taylor was in the bus. She’d hang out with her the whole weekend. With Hazel, that would be an amazing weekend, yeah. So Tom Hanks by default ends up being the crew chief. Money wouldn’t be my trigger, it would be lack of ability. I’ve never done a backflip. I can barely do a front flip in the swimming pool. My body won’t allow me to do those particular movements. So the money wouldn’t help? It wouldn’t really matter on cash. I just honestly wish I could do one, period. 12. Each week, I ask a driver to give me a question for the next interview. Last week was Joey Logano. Let me back up. The previous week he was asked a question by Alexander Rossi, which was: What do you think of Danica? So he heard that and wanted his question for the next person to be: What do you think of Joey Logano? Um…what do I think of Joey Logano? I think he has an amazing smile. I don’t know. I feel like those are things you talk about when people are deceased, and Joey’s still with us. So I’m gonna save my comments for Joey. I think that’s weird that Joey wants to know what I think of him, or what anyone thinks of him. The next interview I’m doing is with Ricky Stenhouse Jr. Do you have a question I can ask Ricky? Yeah. Ricky made fun of people for years for being into fitness and trying to stay in shape, and recently I’ve noticed that he is into fitness and all of a sudden it has become important to him. I would like to know what has happened in his life to make him want to be more fit. I didn’t know that. So he used to poke fun at you and people like that? Yeah. He and (Clint) Bowyer. And Bowyer also is a little closet workout guy. He doesn’t want anyone to know it; he wants to kind of come across as kind of this like Jack Daniels, Marlboro-smokin’ tough guy, and the reality is he has some running shoes and he runs and doesn’t really want people to know. I was listening to Brett Griffin’s podcast, and he said Bowyer has a trainer and he trains every day now. Yeah, I think he trains with his wife. Well they have someone that comes to their house. I think it’s one of those Burn Boot Camp things. So everybody’s getting into it. I mean, if he is, for sure. Yeah. It really comes across as Jamie was not interested in this interview. Ive noticed as the years go by, Jamie seems more arrogant. Hope you and Sarah have a good week off, a safe trip to Sonoma and your moving is going well. I have too agree with James. I think Jamie thinks this is beneath his intelligence. Lighten up and have fun. Not impressed with him not putting his wife first relating to Kate Upton.